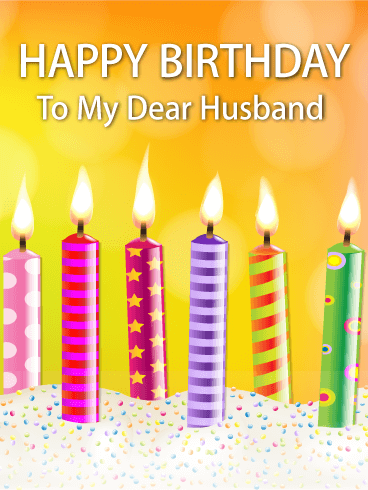 Gift your daughter-in-law a dozen birthday wishes on her special day! Tell her to close her eyes, make a wish, and blow as hard as she can. 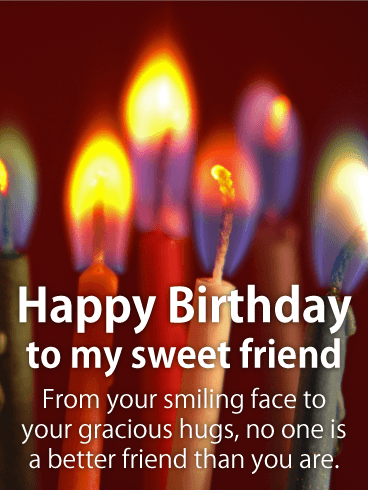 Even if it takes three tries to blow out all the candles, she'll still receive your birthday wish for her – a year of boundless joy and unparalleled love. 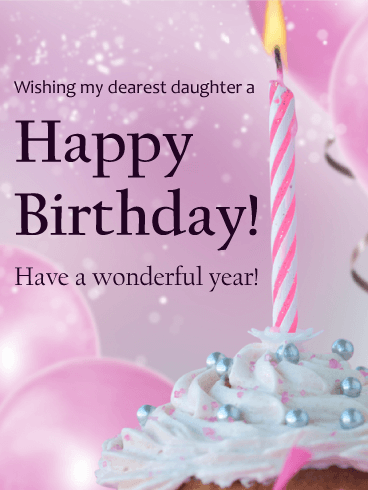 Let her know how much you treasure your daughter-in-law as a member of the family by sending her this fantastic birthday card. Send your mom a cake full of wishes! 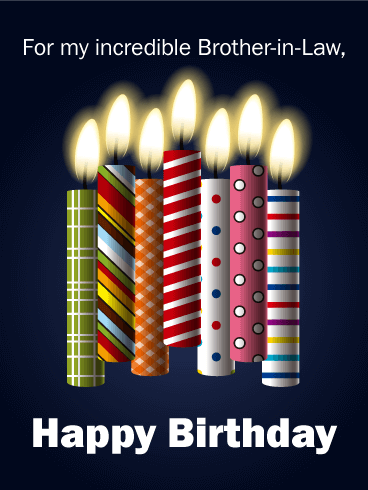 The cake is frosted and the candles are lit, so let the birthday magic begin! 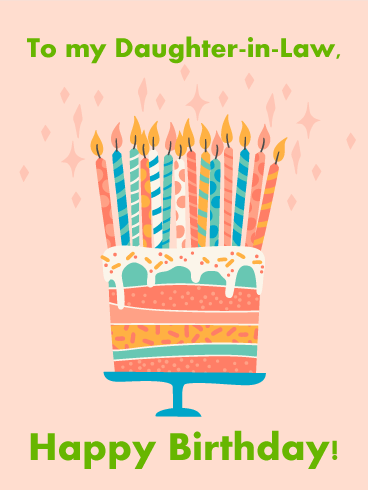 Send this fun birthday card to your mom and get the festivities going. There's never been an easier or more fun way to send a birthday greeting card. Surprise your mom on her birthday with this colorful birthday card full of sprinkles and candles galore. There are people in the world that you bump into and sparks fly. And while lovers might burn hot and bright, friends are the small flames that keep the dark away night after night. Wish your friend a life full of wonders, a life full of hope. For just as she has been one of your guiding lights, you have always returned the favor. 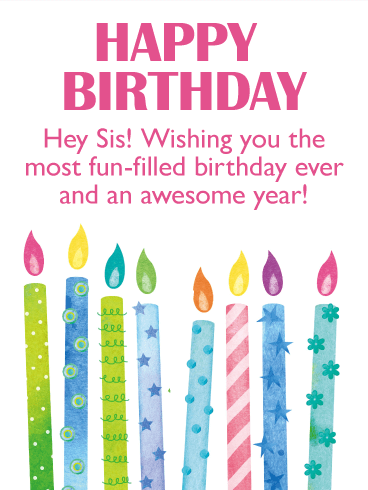 And on her birthday, with your help, she'll shine tall and strong thanks to your birthday card. One, two, three...blow! Eventually in friendships, you stop counting the candles on the cake and start counting down to blowing out the candles. Birthdays transform from aging celebrations to personal revelries, highlighting accomplishments and bringing up memories. And oh, do you and your friend have lots of good memories about each other. 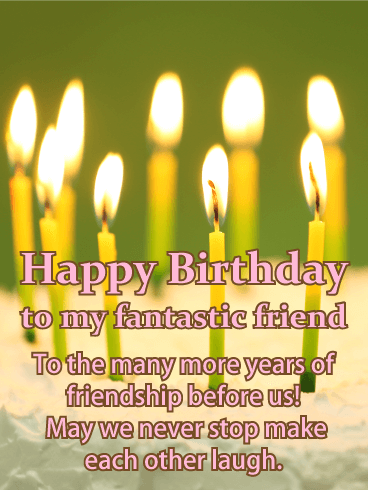 Wish your friend health and success for the next year while filling their birthday with joy! 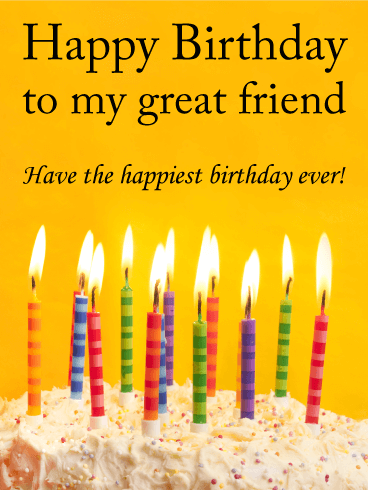 If you have a friend that you think is wonderful, then let them know with this cheerful happy birthday card! After all, everyone should receive compliments on their birthday! 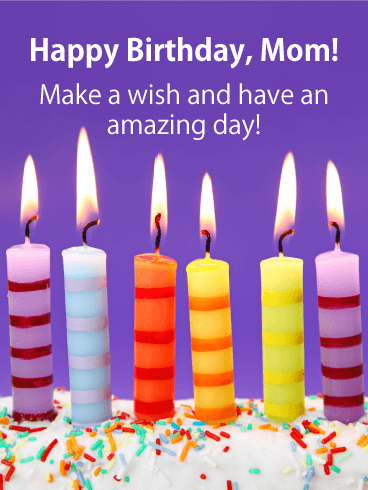 Colorful birthday candles with pretty patterns fill the background of this charming greeting card, and will put a smile on your friends face! 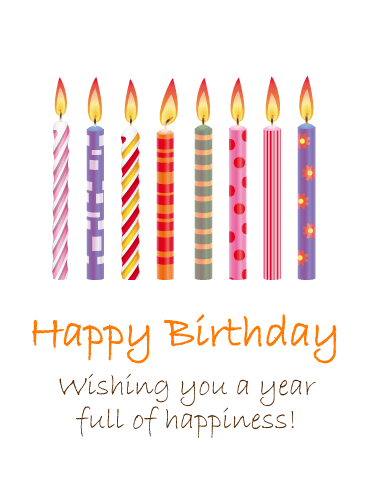 Make sure to send this thoughtful birthday card over to your friend so you can add some joy to their big day! 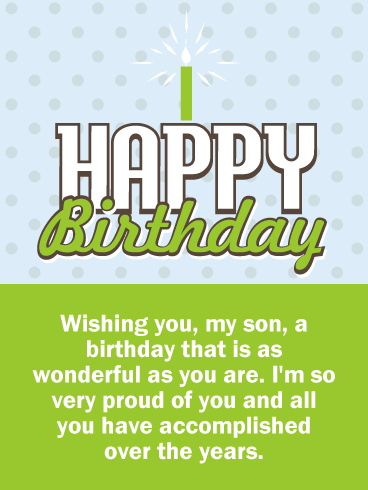 You can let your son know how very proud you are of him on his birthday with this thoughtful happy birthday card. 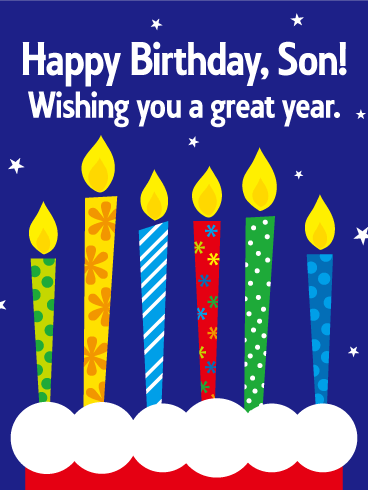 It will allow you to wish your son a wonderful birthday as well as express how you feel about his accomplishments. 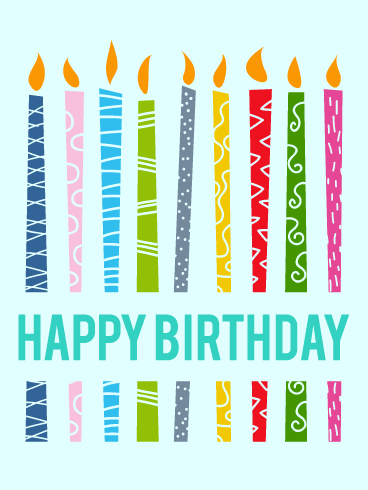 This birthday card features fun happy birthday lettering with a birthday candle on top! 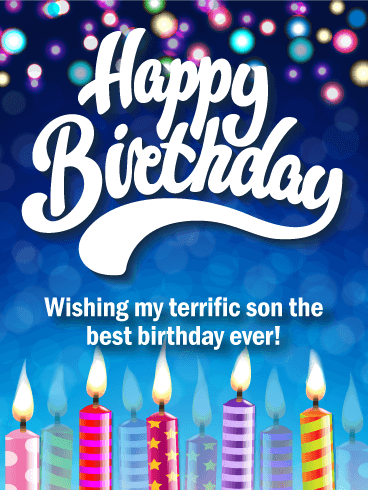 Send this card over to your son, it will make his birthday even better! 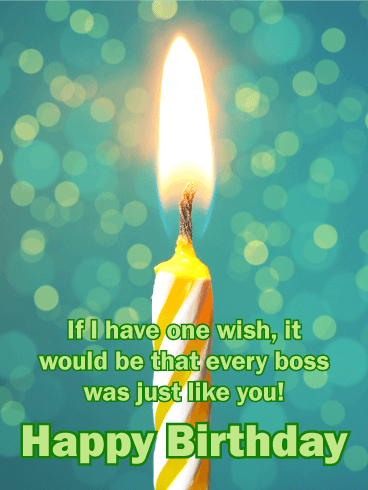 If you've got a great boss, their birthday is the perfect time to let them know! The sentiment is a sweet one, reminding your boss that they really are one-of-a-kind. 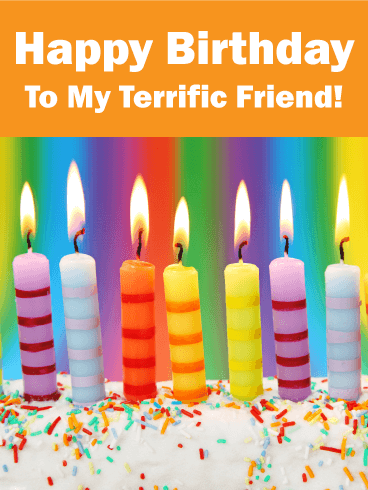 This very colorful Happy Birthday card was made specifically for your terrific friend. It has celebration written all over it. It features a rainbow background with decorative candles on a delicious frosted cake! This birthday card was definitely designed to add some excitement to someone's day. Plus, think of how much your friend is going to love the fact that you think that they are terrific! 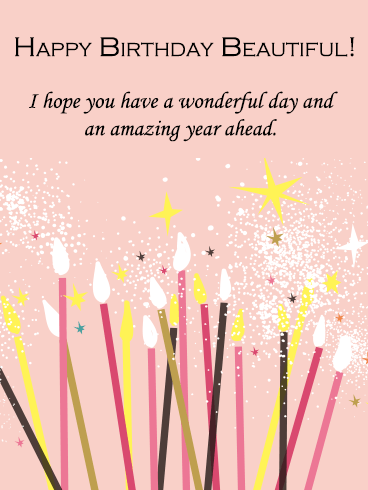 Send a Happy Birthday card that will light up your friend's day! 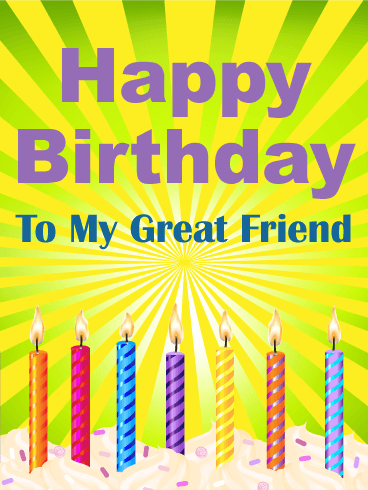 It features a bright green background that gives this birthday card an element of excitement! The final touch is the colorful birthday candles that are sitting atop a yummy cake with frosting and sprinkles, so good! 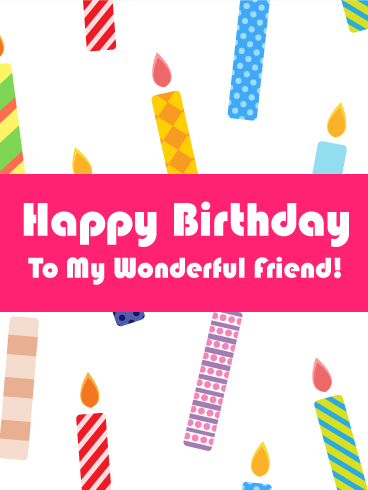 Send this card out to your friend to wish them a Happy Birthday, it will add cheer to their day! Bright and festive. Colorful and fun. 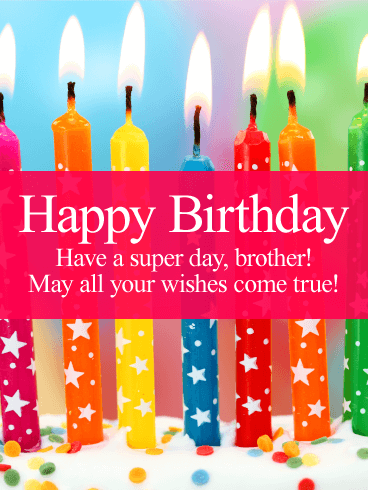 Send your brother a card with a cake full of candles! 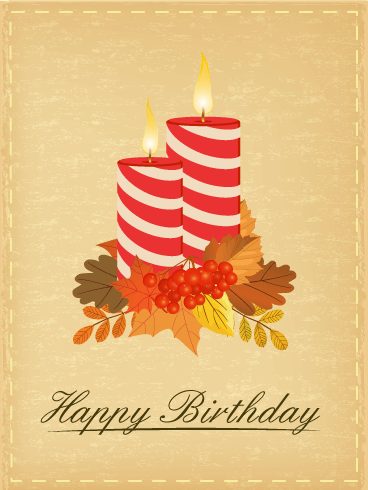 This birthday card celebrates your brother's birthday with a classic funfetti cake and brightly colored candles. It will put a smile on his face and get him thinking about what his big birthday wish should be this year. Send it today-it's fast, fun, and easy! The perfect birthday card for a great son. Your son might not like you to make a lot of fuss over him, but on his birthday he deserves to know how much you care! 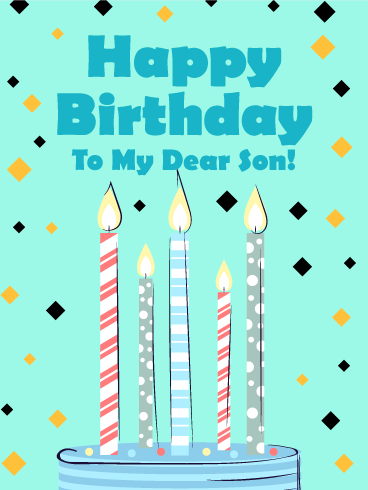 A quick, simple birthday card is a fun way to let your son know you are thinking of him on his birthday. 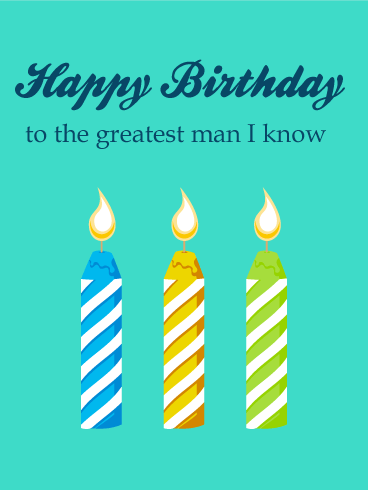 Send this handsome birthday card to your son today. 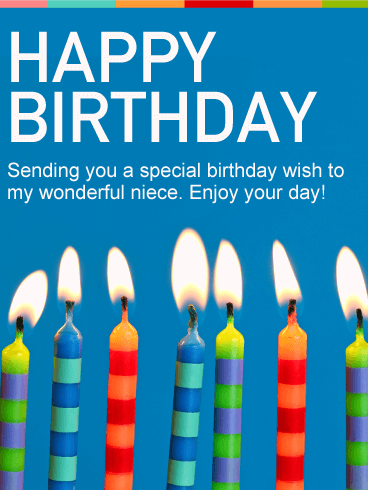 Light up your niece's birthday with this bright card! 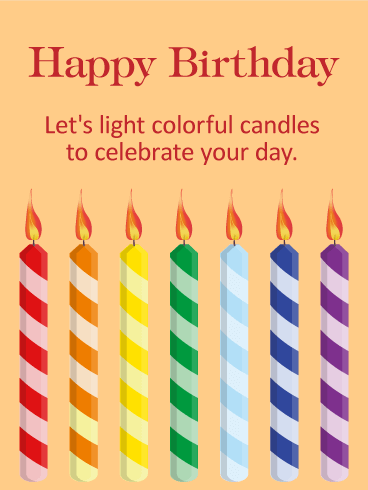 Seven colorful candles will bring her light and joy for her birthday. Each candle is a different wish for her happiness in the year to come. 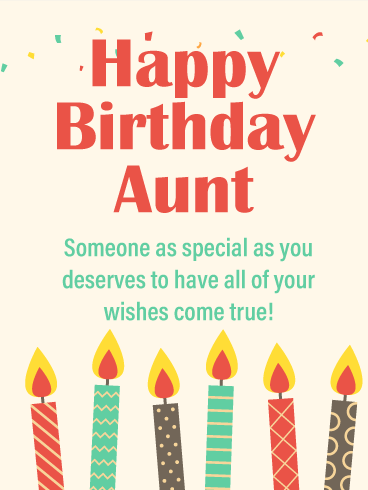 This birthday card delivers everything she needs for the best birthday ever - all from you, her favorite uncle or aunt! Make your niece happy this year. 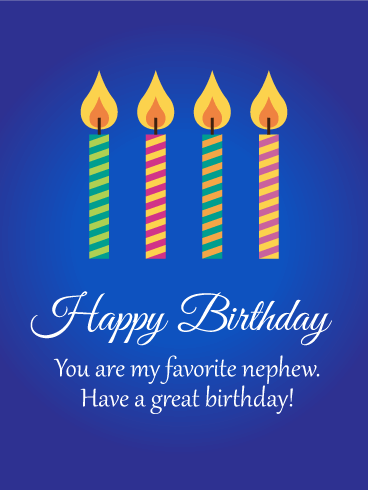 A celebratory birthday card for your favorite nephew is all you need to make his special day perfect! Elegant and festive at the same time, this birthday card will surprise your favorite nephew and put a large smile on his face. He needs to have birthday this card, don't make him wait. 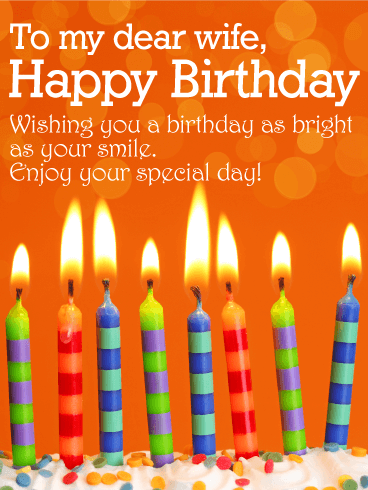 Offer him this elegant birthday card to make his day special! Make a wish! We hope it's to get this party started! 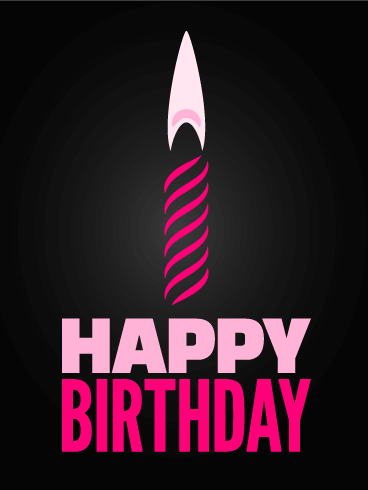 This birthday card is lush and stylish in its minimalism. Two-toned black and pink make a bold statement, and this card is sure to make fashionistas and divas swoon.